To Cite: Deng Y, Qiu L. Mushroom Poisoning in Children: A Five-Year Review, Iran J Pediatr. Online ahead of Print ; 29(1):e65262. doi: 10.5812/ijp.65262. Background: Mushroom poisoning is a global problem and can be a source of major mortality and morbidity. Children can easily be exposed to inadvertent mushroom ingestion. Objectives: The aim of this study was to assess the demographic, clinical, and laboratory features of pediatric patients with mushroom poisoning. Methods: This was a retrospective and observational study of reported cases of exposure to mushroom poisoning at the Department of Pediatrics at West China Second University Hospital of Sichuan University and Wan Yuan Central Hospital between June 2011 and July 2016. The patients’ demographic, clinical, and laboratory features were evaluated. Results: Fifty-eight patients aged between 1.22 and 16.71 years old were studied; 24 patients were female (41%) and 34 were male (59%). Thirty-seven (63.79%) patients had consumed mushrooms in the summer. The most frequent complaints were nausea and vomiting (98.28%). The onset of mushroom toxicity symptoms was divided to early-onset (< 6 hours after ingestion) and late-onset groups (6 to 24 hours). The incidence of life-threatening cases was higher in the late-onset group than that of the early-onset group (88.9% versus 12.2%, P < 0.0001). Three patients with mushroom poisoning died due to fatal hepatic failure, and one patient died due to cardiac arrest (myocardial toxicity). The value of White Blood cell Count (WBC), total bilirubin, and number of involved organs were significantly higher in the group who died than that of the survived group (14.9 × 109 versus 11.8 × 109, P = 0.002; 125 versus 8.5, P = 0.0001; 4.5 versus 1, P < 0.0001, respectively). The level of hemoglobin was lower in the group who died than those who survived (111 versus 132, P = 0.001). Conclusions: Parents and children must be taught to avoid eating unknown mushrooms. Life-threatening poisoning cases are often encountered in patients with late-onset mushroom toxicity symptoms. When children present nausea and vomiting during the rainy season, doctors should maintain keen vigilance towards mushroom poisoning. Acute liver failure is the main cause of death, yet myocardial toxicity should also be considered. Mushroom poisoning is a global problem and can be a source of major mortality and morbidity. There are approximately 5000 species of mushrooms, worldwide (1). It has been estimated that there are 400 species considered as toxic to humans in China (2). Picking wild mushrooms for human consumption has been a long-standing tradition in southern China, including in Sichuan province. However, it is somewhat difficult to discriminate between poisonous and non-poisonous mushrooms. During the seven-year period from 1994 to 2011 in China, statistical data showed 11418 cases of mushroom poisoning exposure with a mortality rate of 12.39% (3). The symptoms and signs depend on mushroom toxins and range from mild gastroenteritis to organ failure, especially fatal liver failure. While gastroenteritis is generally transient, liver failure may be irreversible and even lethal without liver transplantation. Amanita phalloides (death cap) is one of the most famous poisonous mushrooms, leading to the majority of lethal cases of human mushroom poisoning, worldwide (4, 5). In adults, symptoms are commonly first noticed in the gastrointestinal system (6-9). According to Diaz’s opinion (10), mushroom poisoning is classified based on the time of presentation and the damage to the target organs as early-onset (< 6 hours), late-onset (6 to 24 hours), and delayed-onset (> 24 hours) toxic syndromes. Early-onset toxicities usually include neurotoxic, gastrointestinal, and allergic syndromes. Late-onset toxicities include hepatotoxic and nephrotoxic syndromes, and delayed-onset toxicities include delayed nephrotoxic and delayed neurotoxic syndromes. In adults, early-onset toxicities are most frequently encountered (6, 8). Children are special and can easily suffer from inadvertent mushroom ingestion. They can easily find mushrooms in nature or within their home and eat them uncooked (11). However, data solely concerning children as a group are limited. The aim of this study was to describe the demographic, clinical, and laboratory features of pediatric patients with mushroom poisoning and to analyze the relationships between clinical factors and mushroom poisoning prognosis. This study was retrospectively designed by reviewing the files of pediatric patients with mushroom poisoning, who were admitted to the Pediatric Departments at West China Second University Hospital of Sichuan University (WCSUH-SCU) and Wan Yuan Central Hospital (WYCH) between June 2011 and July 2016. WCSUH-SCU, is a grade-A tertiary hospital and is a medical center for women and children in southwestern China, Chengdu city, Sichuan province. WYCH is a grade-A secondary hospital in Wan Yuan City, Sichuan province. The inclusion criteria were as follows: (1) A clear history of MP poisoning, and (2) age of < 18 years old. Information on patient demographic details, clinical presentation, onset time for symptoms, season and location, laboratory findings, treatments and clinical outcomes were obtained. The mushroom toxins could not be analyzed. Ethical approval was obtained from the Ethics Committee of the West China Second University Hospital. All data were analyzed with SPSS 20.0 software (SPSS, Inc., Chicago, IL, USA). Data are presented as mean, median or percentage. Parametric data were analyzed by Student’s t test. Nonparametric data were analyzed by the Mann-Whitney U test. Categorical data were compared using the Pearson chi-square test or Fisher’s exact method. The significance level was 0.05, and all statistical tests were two-tailed. The study included a total of 58 patients within a period of five years. Of these patients, 21 were admitted to WCSUH-SCU and 37 were admitted to WYCH. The median age was 8.92 (range, 1.22 to 16.71) years; 24 patients (41%) were female and 34 (59%) were male. It was established that 37 (63.79%) patients had consumed mushrooms in the summer and 21 (36.21%) in the autumn (Figure 1). Mushrooms were intentionally consumed as delicacies in all 58 patients. Only two patients (3.4%) came from the urban area of Chengdu city, whereas 56 patients (96.6%) came from the rural area of Sichuan province. Of the 58 patients, 28 received treatment at the nearest hospital before being transferred to WCSUH-SCU or WYCH. The treatments included gastric lavage, administration of activated charcoal, and supportive treatment (Figure 2). The amount of toxic mushroom ingestion could not be accurately described in most patients. Only a one-year-old child had toxic symptoms after two tablespoons (about 4 mL) of mushroom ingestion. The symptoms appeared within the first six hours of ingestion (early-onset group) in 48 (82.8%) patients and between six to 24 hours (late-onset group) in nine (17.2%) patients. Generally, the pediatric patients presented complaints of nausea/vomiting (98.28%) and abdominal pain (55.18%). The other symptoms and signs included dizziness or lethargy (10.34%), delirium (6.90%), headache (5.17%), seizures (6.90%), blurred vision (1.72%), coma (8.62%), jaundice (8.62%), hypouria (3.45%), and fever (3.45%) (Table 1). Of these patients, 44 (75.9%) had gastrointestinal symptoms and mild abnormal liver function (mild level) and 14 (24.1%) had symptoms and signs of abnormal central nervous system function, cardiovascular symptoms, and severe liver dysfunction (life-threatening). More patients had potentially life-threatening mushroom poisoning in the late-onset group compared to those in the early-onset group (88.9% versus 12.2%, P < 0.0001) (Table 2). a Symptom onset < 6 hours after mushroom ingestion. b Symptom onset ≥6 hours and < 24 hours after mushroom ingestion. Laboratory abnormalities included increased WBC (55.2%), thrombocytopenia (10.3%), anemia (8.6%), prothrombin time (PT) (15.5%), activated partial thromboplastin time (APTT) (10.3%), alanine aminotransferase (ALT) (24.2%), aspartate aminotransferase (AST) (46.6%), total bilirubin (19%), creatinine (18.9%), and hyponatremia (8.6%) (Table 3). Of the patients, 11 (19%) accepted at least one method of hemoperfusion, plasma exchange or hemopurification treatment during the observation and treatment period. Patients with mild symptoms recovered with symptomatic treatments and short hospital care durations. In the life-threatening group, four (6.9%) patients died during their hospital stay. Three patients suffering from mushroom poisoning died due to fatal hepatic failure despite receiving plasma exchange or hemopurification treatment, and one patient died from severe myocardial damage (leading to cardiac arrest) on hospital day two (CK: 10489 U/L; CK-MB: 633.4 U/L; myoglobin: 983.7 U/L; troponin I: 1.04 U/L; K+ 4.09 mmol/L) (Table 4). Statistically significant differences existed were found in the values of WBC, Hb, total bilirubin, and the number of involved organs between the group who died and those who survived (14.9 versus 11.8, P = 0.002; 111 versus 132, P = 0.001; 125 versus 8.5, P = 0.0001, 4.5 versus 1, P < 0.0001, respectively) (Table 5). a CK: 10489 U/L, CK-MB: 633.4 U/L, myoglobin: 983.7 U/L, troponin I: 1.04 U/L, K+ : 4.09 mmol/L. He died due to cardiac arrest on hospital day 2. Mushroom poisoning is an important global public health problem. There are approximately 5000 species of mushrooms, worldwide (1). Approximately 4000 species of mushrooms have been classified in China, and approximately 400 species are considered poisonous (2). It is very popular to consume wild mushrooms in many rainy areas due to their nutritional benefits and delicious taste. However, non-poisonous and poisonous mushrooms may be frequently mistaken for one another, leading to mushroom poisoning incidents. According to reports from the USA, there are approximately five wild mushroom exposures for every 100000 people, annually (12). In China, data from the national food poisoning report of the Chinese Centers for Disease Control and Prevention (CDC) showed that 1954 mushroom poisoning cases were reported with a total of 409 deaths from 2004 to 2007. Mushroom poisoning was the main cause of death, and mortality was 20.93% (13). The mortality rate varied from 10% to 90% in adults (5, 14-19). In the current report, the motality rate was 6.9% (4/58) in children. In this study, patients, who had severe clinical manifestations, were treated with gastric lavage and administered activated charcoal in addition to antibiotics (Penicillin G) and blood purification treatment. Blood purification treatment may be an effective treatment for reducing mortality in suspected mushroom poisoning patients (6). In the group who died, the levels of WBC, total bilirubin, and number of involved organs were higher than those in the group who survived, yet the level of Hb was lower than that in the survived group. The ALT and AST levels, and total bilirubin seem to be an index of prognosis in children. The laboratory results of Cevik and Unluoglu (20) indicated that blood urea nitrogen, creatinine, ALT and AST were higher in lethal and complicated cases. A number of articles (7, 21, 22) have described factors associated with a greater possibility of death, including low sodium and high urea, AST, ALT, total bilirubin, PT, APTT, international normalized ratio, and lactate dehydrogenase. In the current study, 63.79% of the patients consumed mushrooms in the summer. The results were consistent with previous studies (6, 7, 15). In Sichuan province, the rainy season begins in the summer, which is when mushrooms are more frequently collected. Noting the high incidence of mushroom poisoning during summer may help doctors make an earlier diagnosis and take prompt action. In children, the first-noticed complaints of mushroom poisoning are gastrointestinal symptoms, which can be mistakenly diagnosed as common bacterial diarrhea. In the current study, all mushroom poisonings were due to the consumption of wild mushrooms. The pediatric patients frequently presented symptoms of nausea, vomiting, and abdominal pain. The other uncommon symptoms and signs included dizziness, delirium, headache, seizures, blurred vision, coma, jaundice, hypouresis and fever. Erenler et al. (11) and Eren et al. (7) reported similar results. These symptoms may help recognize MP early. In the current study, there were 49 (84.5%) patients in the early-onset group and nine (15.5%) patients in the late-onset group. Moreover, the incidence of life-threatening exposure was higher in the late-onset group than that of the early-onset group. Colak et al. (6) reported similar outcomes in adults. Life-threatening cases with late-onset syndrome poisoning are occasionally seen in Hong Kong district (8). Late-onset syndrome includes hepatotoxic, nephrotoxic, and erythromelalgia syndromes (10). The current study showed that three children suffering from mushroom poisoning died due to fatal hepatic failure. Amatoxin poisoning was suspected. 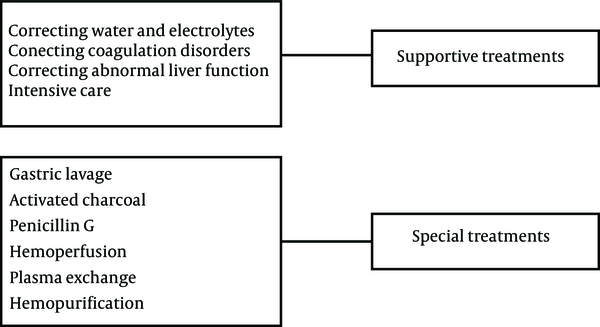 Liver transplantation could be an optional treatment. Notably, one patient died due to cardiac arrest. It could be assumed that he suffered myocardial toxicity. Because he died on hospital day two, the results of his liver function and renal function were almost normal. His K+ level was 4.09 mmol/L. However, his values of cardiac markers were extremely high with a history of mushroom poisoning. Reportedly, he did not have a history of cardiovascular disease. Ren et al. (23) suggested that mushroom poisoning symptoms should be classified to five types, gastroenteritis, acute renal failure, acute liver failure, psychoneurological disorders and hemolysis, based on the analysis of 3638 patients with mushroom poisoning from 1980 to 2002 in China. Chen (15) reviewed 102 cases of mushroom poisoning from 1994 to 2012, and seven mushroom poisoning symptoms were suggested for clinical diagnosis and treatment: Gastroenteritis, acute liver failure, acute renal failure, psychoneurological disorder, hemolysis, photosensitive dermatitis and rhabdomyolysis. Based on the current study, it could be suggested that acute myocardial toxicity syndrome should be added to the list of mushroom poisoning symptoms. The researchers considered this kind of classification method to be appropriate. The identification of mushroom species can be very difficult in China. In the other countries, such as in the USA, the species identification rate was less than 6% (24). Myocardial toxicity from poisonous mushrooms can cause cardiac arrest and directly lead to death. Clinicians should pay attention to this circumstance. Additionally, in the study by Erenler et al. (11), the most common Electrocardiogram (ECG) abnormalities were sinus tachycardia, sinus arrhythmia, and ST/T inversion in a group of 175 patients diagnosed with mushroom poisoning. However, cardiac makers were normal. In the current report, the values of cardiac makers in this patient were extremely high, yet his liver function was normal (Table 4). It is unfortunate that the poisonous species consumed in this case could not be confirmed. Finally, there is a limited number of reports on cardiac toxicity, and more scientific observations are needed concerning toxicity of the heart due to mushroom poisoning. First, the toxin levels and mushroom species were not identified. Second, it is difficult to do the follow up visits for those who survived because most of these children came from rural areas of Sichuan province. Third, it was a retrospective study and only included small number of patients with late-onset symptoms. Mushroom species are diverse, and various clinical manifestations occur based on mushroom species. Clinicians should take action towards early diagnosis and treatment. Children are at a high risk of exposure to wild and uncooked mushroom poisoning. Parents and children should be taught to avoid eating unknown, uncooked mushrooms from nature. Life-threatening poisoning cases are often encountered in patients with late-onset mushroom toxicity symptoms. Acute liver failure is the main cause of death, but doctors should not ignore myocardial toxicity. The authors would like to thank the support of members of Wan Yuan Central Hospital. Ethical Considerations: Ethical approval was granted from the Ethics Committee at the West China Second University Hospital. 1. Ahishali E, Boynuegri B, Ozpolat E, Surmeli H, Dolapcioglu C, Dabak R, et al. Approach to mushroom intoxication and treatment: Can we decrease mortality? Clin Res Hepatol Gastroenterol. 2012;36(2):139-45. doi: 10.1016/j.clinre.2011.11.004. [PubMed: 22189510]. 2. Mao XL. [Poisonous mushrooms and their toxins in China]. Mycosystema. 2006;25:345-63. Chinese. 3. He Q, Xie LZ, Ma PB, Sun CG. [The analysis of The poisonous animals, poisonous plants and mushroom poisonings in China]. J Adverse Drug React. 2013;15(1):6-10. Chinese. 4. Frank H, Zilker T, Kirchmair M, Eyer F, Haberl B, Tuerkoglu-Raach G, et al. Acute renal failure by ingestion of Cortinarius species confounded with psychoactive mushrooms: A case series and literature survey. Clin Nephrol. 2009;71(5):557-62. doi: 10.5414/CNP71557. [PubMed: 19473617]. 5. Garcia J, Costa VM, Carvalho A, Baptista P, de Pinho PG, de Lourdes Bastos M, et al. Amanita phalloides poisoning: Mechanisms of toxicity and treatment. Food Chem Toxicol. 2015;86:41-55. doi: 10.1016/j.fct.2015.09.008. [PubMed: 26375431]. 6. Colak S, Kandis H, Afacan MA, Erdogan MO, Gunes H, Kaya E, et al. Assessment of patients who presented to the emergency department with mushroom poisoning. Hum Exp Toxicol. 2015;34(7):725-31. doi: 10.1177/0960327114557902. [PubMed: 25378094]. 7. Eren SH, Demirel Y, Ugurlu S, Korkmaz I, Aktas C, Guven FM. Mushroom poisoning: Retrospective analysis of 294 cases. Clinics (Sao Paulo). 2010;65(5):491-6. doi: 10.1590/S1807-59322010000500006. [PubMed: 20535367]. [PubMed Central: PMC2882543]. 8. Chan CK, Lam HC, Chiu SW, Tse ML, Lau FL. Mushroom poisoning in Hong Kong: A ten-year review. Hong Kong Med J. 2016;22(2):124-30. doi: 10.12809/hkmj154706. [PubMed: 26980450]. 9. Schenk-Jaeger KM, Rauber-Luthy C, Bodmer M, Kupferschmidt H, Kullak-Ublick GA, Ceschi A. Mushroom poisoning: A study on circumstances of exposure and patterns of toxicity. Eur J Intern Med. 2012;23(4):e85-91. doi: 10.1016/j.ejim.2012.03.014. [PubMed: 22560399]. 10. Diaz JH. Syndromic diagnosis and management of confirmed mushroom poisonings. Crit Care Med. 2005;33(2):427-36. doi: 10.1097/01.CCM.0000153531.69448.49. [PubMed: 15699849]. 11. Erenler AK, Dogan T, Kocak C, Ece Y. Investigation of toxic effects of mushroom poisoning on the cardiovascular system. Basic Clin Pharmacol Toxicol. 2016;119(3):317-21. doi: 10.1111/bcpt.12569. [PubMed: 26879235]. 12. Shih RD. Plants, mushrooms, and herbal meications. In: Marx JA, Hockberger RS, Walls RM, editors. Rosen's emergency medicine: Concepts and clinical practice. 20. 8th ed. Philadelphia, PA: Saunders Elsevier; 2014. p. 66-75. 13. Jin LM, Li Q. [Analysis of food poisoning events in China from 2004 to 2007]. Dis Surveill. 2009;24:459-61. Chinese. 14. Yamaura Y. [Recent trends of mushroom poisoning in Japan]. Chudoku Kenkyu. 2013;26(1):39-43. Japanese. [PubMed: 23600266]. 15. Chen Z, Zhang P, Zhang Z. Investigation and analysis of 102 mushroom poisoning cases in Southern China from 1994 to 2012. Fungal Divers. 2013;64(1):123-31. doi: 10.1007/s13225-013-0260-7. 16. Rumackm B H, Spoerkem D G. Handbook of mushroom poisoning: Diagnosis and treatment. 2nd ed. LLC; USA: CRC Press; 1994. 17. Smith MR, Davis RL. Mycetismus: A review. Gastroenterol Rep (Oxf). 2016;4(2):107-12. doi: 10.1093/gastro/gov062. [PubMed: 26637206]. [PubMed Central: PMC4863189]. 18. Ward J, Kapadia K, Brush E, Salhanick SD. Amatoxin poisoning: Case reports and review of current therapies. J Emerg Med. 2013;44(1):116-21. doi: 10.1016/j.jemermed.2012.02.020. [PubMed: 22555054]. 19. Karvellas CJ, Tillman H, Leung AA, Lee WM, Schilsky ML, Hameed B, et al. Acute liver injury and acute liver failure from mushroom poisoning in North America. Liver Int. 2016;36(7):1043-50. doi: 10.1111/liv.13080. [PubMed: 26837055]. 20. Cevik AA, Unluoglu I. Factors affecting mortality and complications in mushroom poisonings over a 20 year period: A report from Central Anatolia. Turk J Emerg Med. 2014;14(3):104-10. doi: 10.5505/1304.7361.2014.36024. [PubMed: 27331181]. [PubMed Central: PMC4909943]. 21. Trabulus S, Altiparmak MR. Clinical features and outcome of patients with amatoxin-containing mushroom poisoning. Clin Toxicol (Phila). 2011;49(4):303-10. doi: 10.3109/15563650.2011.565772. [PubMed: 21563906]. 22. Escudie L, Francoz C, Vinel JP, Moucari R, Cournot M, Paradis V, et al. Amanita phalloides poisoning: Reassessment of prognostic factors and indications for emergency liver transplantation. J Hepatol. 2007;46(3):466-73. doi: 10.1016/j.jhep.2006.10.013. [PubMed: 17188393]. 23. Ren CS, Wang WQ, Xu ZH, Lu HH, Gao QJ, Guo ZJ, et al. [A study of the clinical classification of 3638 cases of mushroom poisoning]. Chin J Intern Med. 2007;46:229-32. Chinese. 24. Nordt SP. 5-Year analysis of mushroom exposures in California. West J Med. 2000;173(5):314-7. doi: 10.1136/ewjm.173.5.314.